We have received a number of requests that our games be made available on the Android platform. It is our intention to bring our existing iPhone games to Android during the next few months. Those of you with an iPhone or iPad can now try Airport Madness Challenge for free. Although the full version still cost $4.99 for six levels of action, a ‘lite’ version is now available from the App Store which offers two free levels. Additional levels can be purchased within the app for just $.99 each. The high resolution of this app looks stunning on the iPad, although it plays well with iPhone and iPod Touch as well. Perhaps the greatest leap this app makes beyond Airport Madness Mobile is the multi-player function. Using Bluetooth you can play against any friend with an iPad, iPhone or iPod in either of two multiplayer modes: Tycoon Mode or Survival Mode. In Survival Mode it is a showdown to see who can last the longest without a midair collision. In Tycoon Mode your goal is to drive the opponent into bankruptcy. This entry was posted in airport madness challenge, iphone games on November 26, 2010 by admin. As I type code for our upcoming air traffic control games, a question repeatedly comes to my mind. Can a computer manage real air traffic? Could we remove the human factor from radar screens everywhere, and let a computer make these decisions? A computer is able to observe altitudes, speeds and headings, as well as flight plans. A computer is most certainly capable of broadcasting comprehendable air traffic control instructions to pilots. The coded algorithms required to make such decisions is not rocket science, either. In fact, many of our air traffic control games require some degree of ‘intelligence’ to detect and resolve traffic conflicts. In Airport Madness 3, airplanes see each other and make decisions regarding who should stop and who should go. In our radar game Air Traffic Controller, the system recognizes vertical and lateral losses of separation. This technology already exists in parts of the world, although it’s focus is high-level enroute situations. How hard is it to change a pilot’s flight level, or give the occasional mach assignment? Passing traffic information would be very easy for a computer. Coordination with other sectors, even human ones, would be spot on. However, I am reminded of a drive I made recently through a remote area of Ontario, Canada. I encountered a complete road closure necessitating a backtrack and a complete reroute to my destination. My GPS (I don’t carry roadmaps) insisted that I get back on the highway in spite of the closure. I had absolutely no way of determining what other routes were available to me and finally had to pull over to get some human advice on how I would reach my destination. Computers are great, but when the situation is anything but normal a human brain is needed. In air traffic control things are seldom ever normal, except perhaps in the high flight levels where aircraft cruise steadily and predictably. Where things can fall apart are the unusual circumstances, which happen so often in ATC that they become almost expected. Thunderstorm activity, icing, turbulence, emergencies, loss of radar, re-routes, flow control, and airborne holds to name just a few. Another big reality is the lack of radar information that exists in the world. There is very little coverage out there. If you were to look at a map of the world that depicted areas of radar coverage, most of you would be surprised at how little there is. Granted, they are doing amazing and wonderful things with GPS these days, but at the moment there is very little radar, especially at lower altitudes and away from busy terminal areas. There is almost no radar information over the oceans. Computers make guesses, augmented by position reports from the pilots. As a programmer, I can’t imagine the amount of code that would be required to detect and handle all of the possible situations that can unfold in the world of air traffic control. In risk of sounding naive, I think this technology is still quite a ways off. This entry was posted in air traffic control games on November 26, 2010 by admin. An old classic. Bob Newhart doesn’t need profanity to make things funny. For those of you not familiar with Bob Newhart, he is a terrific comedian who had a major hit comedy show in the 70’s. This entry was posted in Humour, videos on November 10, 2010 by admin. So I’ve installed the latest version of Internet Explorer, IE 9 Beta. While I think it is a very decent browser, I was disappointed to see that I was unable to download our air traffic control games without receiving a security warning. Some customers have complained of this issue too, and lately we have had to to point more and more customers to our alternate download files, which use the Adobe AIR installer. For some reason, Internet Explorer seems to trust the AIR format over the .exe format. Many malicious software developers choose the .exe format, so I don’t blame Microsoft for filtering ours. We’ve also received complaints from customers who receive warnings upon downloading, such as “This publisher has not been verified. Are you sure you want to install this file?”. 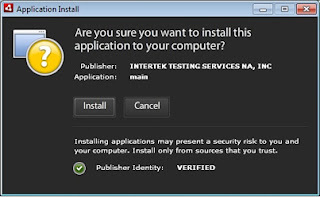 This has prompted us to purchase a digital certificate, which does nothing more than reassure customers that the software they are installing is legitimate. Digital certificates are not cheap, nor are they easy to obtain. A company that wants to obtain a digital certificate to assure customers of their legitimacy must first convince a company such as Verisign or Thawte that they are, in fact, legitimate software developers. Airport Madness 3, as well as all future developments of Big Fat Simulations, will be digitally signed for customer reassurance. This entry was posted in air traffic control games on November 3, 2010 by admin.